"The BEST dentist in town.. Period.. I have never experienced such incredible care. I would never go anywhere else. He has state of the art equipment.. He is gentle & kind..he even called me on a Saturday to see how I was feeling after a procedure on Friday. I can't say enough about his amazing care!" $149 Home Whitening System A $176 Savings! $70 New Patient Exam Full Mouth Digital Xrays A $122 Savings! Your smile is an everyday source of self-confidence. It is valuable, and worthy of only the most advanced care by a dental team that focuses on your personalized dental health and experience. Dr Duffin understands just how busy your life can be. For your convenience he offers exstended hours. Dr. Ron Duffin, DDS, is an expert when it comes to oral health and can help you attain a beautiful healthy smile! Patient, understanding and talented, Dr. Duffin is committed to providing excellent dental care. Dr. Duffin graduated from the University of Washington School of Dentistry in Seattle, Washington. He is an accredited member of The American Academy of Implantology, and he is also a member of The American Dental Association, The California Dental Association, and The Tri County Dental Society. Dr Duffin is licensed to administer dental conscious sedation. He believes in continuing education and proves his commitment to his patients by his excellent care and constant quest for the most up-to-date knowledge and techniques. Dr. Ron Duffin, DDS is also accredited as an Associate Fellow of the Academy of Implant Dentistry. Our first priority has always been your safety and comfort. We offer several sedation options. With sedation dentistry and our great team, we have created a consistently safe, pain-free and comfortable environment for all of our patients before, during and after their dental procedure. My staff and I are here to assist you with any questions you may have. The artistic creation of natural and beautiful smile is part of beautiful face. Thanks to CEREC technology, crowns can now be administered in just one visit. For many patients this is quite a relief to be able to avoid multiple follow ups and repeat visits that are associated with traditional crowns. A crown is a false top to your natural tooth and helps to prevent bacteria from entering into the pulp area of the tooth, thus preventing infection. 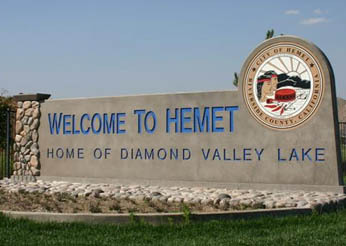 Dr. Duffin is only one of two dentists in Hemet that can provide this service.